This simple cold soup will cool you down on a hot day. Add a lot of fresh herbs to inject summery flavors and Greek yogurt for all-over creaminess. 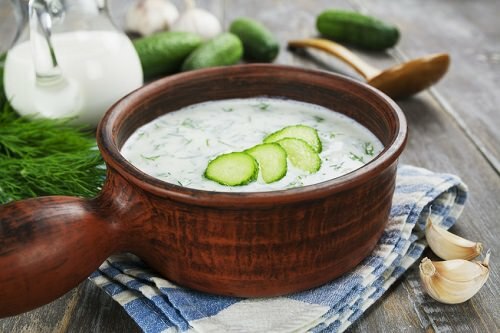 Combine chopped cucumber with plain Greek yogurt, lemon, shallot, garlic, dill, olive oil, parsley, and red onion in your blender and puree until smooth. Cool the soup overnight and season with salt and pepper before serving.